You guys. I’m so excited to share this delicious dinner idea with you. 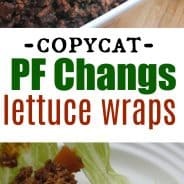 I love a meal that comes together, and you realize just how versatile it can be! Perfect as a game day snack to feed a crowd. Or a weekday meal. Now that my family is back home in Chicago, we are fully immersed into the Bears football season (any Bears fans out there?). And with the start of football season, comes watch parties and tailgating. I’m sure many of you have had this Buffalo Chicken Dip, but I’m making the classic dip into a delicious meal. Don’t get me wrong, the original dip is delicious. But I’m always on the hunt to make my favorite dips into dinners. It becomes a win-win right? 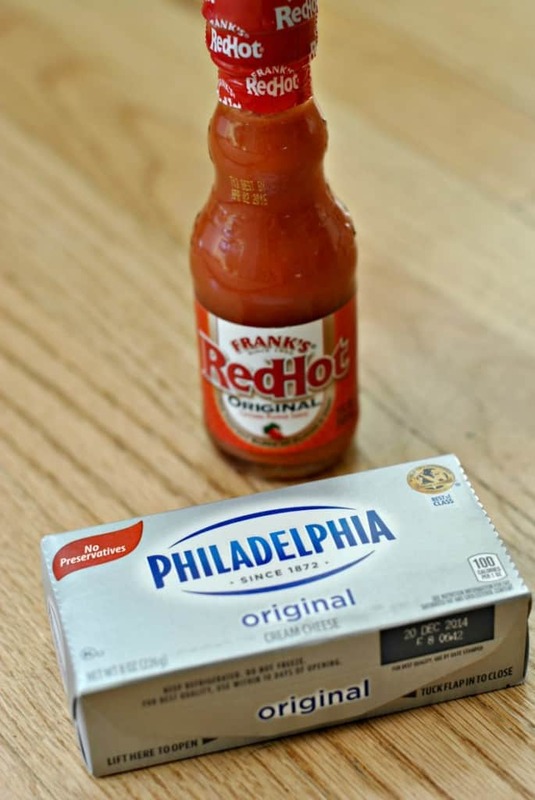 Of course, Buffalo Chicken dip wouldn’t be complete without the two main ingredients: Frank’s Hot Sauce and PHILADELPHIA Cream Cheese. As a brand ambassador for PHILADELPHIA Cream Cheese, I was asked to take this perfect party pair, and come up with my own unique recipe. Today’s Buffalo Chicken Ring is my version of the dip! I also made a creamy Blue Cheese dipping sauce to drizzle over the top and serve with the dinner. 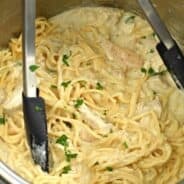 I’m pretty sure your game day fans will love this recipe too! You can see in the photo above that I’ve tried to highlight the key points! Cook your chicken in a large saucepan, add the chopped celery during the last minute or two, just to soften it slightly. 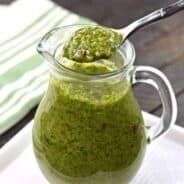 You still want your celery to have a crunch! Drain off the excess water before combining the remaining ingredients. I use a pizza stone when baking this. That way it can go from oven to table, and the stone keeps it warm longer! Lay your first package of crescent rolls in a circle shape, with the wide part in the center and the point facing outward. Repeat with the second package. Use your fingertips to press them gently together and create an “indentation” to fill with Buffalo Chicken. 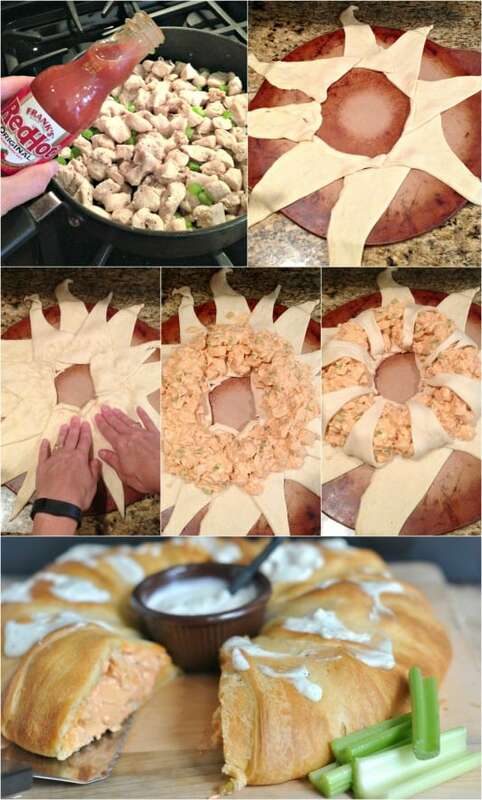 Once you fill the center ring with buffalo chicken, wrap your first layer of crescents over the filling. Repeat with the second layer of crescents. Most of your filling should be covered at this point. You can stretch the crescent rolls to cover it completely. Bake. While baking, mix up your blue cheese dip. You can serve this dip warm, or heat it up so it’s creamy (that’s how I like it)! Serve and enjoy! PHILADELPHIA Cream Cheese is made from fresh local milk and real wholesome cream. It comes to your grocery store in just six days, now that’s fresh! I use PHILADELPHIA Cream Cheese for all my baking because I find that it always gives me perfect results: creamy, decadent results! 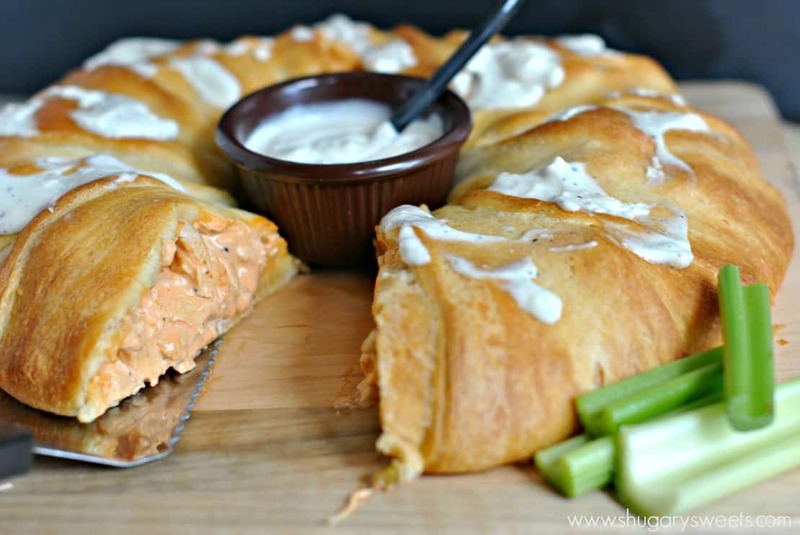 Now, that I’ve enticed you with this Buffalo Chicken Ring recipe, who are you rooting for this season? Or do you just “show up” for the food?! 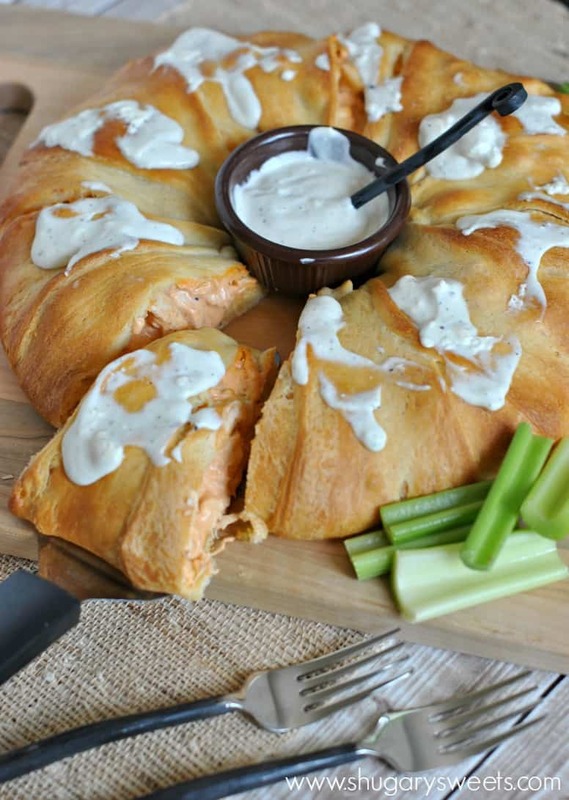 Buffalo Chicken Ring, easy game day dinner recipe! In a large skillet, heat olive oil over medium high heat. Add chicken, salt and pepper and cook until chicken is thoroughly cooked (about 6-8 minutes, but check yours as cooking times vary). Add celery and cook an additional minute or two. Drain off excess water. Add hot sauce and cream cheese and mix until combined thoroughly. Set aside. Using a large pizza pan, open packages of crescent rolls. Lay the first package in a large circle, connecting the wide part of the crescent roll in the center. Top with second package of crescents. Use fingertips to combine and create an indentation to add chicken mixture. Fill indentation with buffalo chicken. Roll triangles up over filling, using hands to spread dough as needed. Bake in a 375 degree oven for 25 minutes. While cooking, combine dressing ingredients in a small saucepan. Heat over low, stirring occasionally, until creamy. Serve with Buffalo Chicken Ring. No matter how hard I try, my hubs won’t let me forget that it’s football season. I have been trying to find ways to get through it (not a sports fan) and burying myself in this sounds perfect! Pinned! mmmm my mouth is watering! I just love anything buffalo and this would be a crowd pleaser for sure! 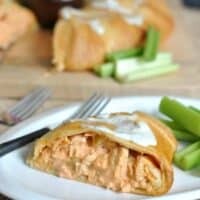 I love buffalo chicken anything and this spin on it looks fabulous! Can’t wait to make it this weekend! I LOVE buffalo chicken dip but have never thought to make it in a way that would work for dinner. Normally I just eat it out of the pan…cause I’m classy like that 🙂 This way looks much better! It has to be Franks Hot Sauce. Yum! That is the only sauce that can get rid of my “buffalo” craving. Crust with buffalo dip – I could eat it all! Yay! I can officially eat my favorite dip for dinner! Thank you Aimee for an fun spin on this dip! This is fabulous! Genius making it into a meal…it wouldn’t last long at our house. I love your twist on this classic combination! So fun! omg, I love anything buffalo – specially dip! Wrap in crescents for dinner? My perfect meal! Love this! This is so creative, Aimee! I love it! Whoa. This looks insane! Great photo tutorial! This looks awesome and you make it look so easy! Buffalo chicken is never a bad idea! Perfect for game day! I am crazy about anything with buffalo chicken so I probably wouldn’t be able to stop eating this! I love this for game day. Buffalo chicken anything is always a hit! This will be a big hit with my husband, and his friends, on Sunday! This is so perfect for game day! It’d disappear in no time around here! 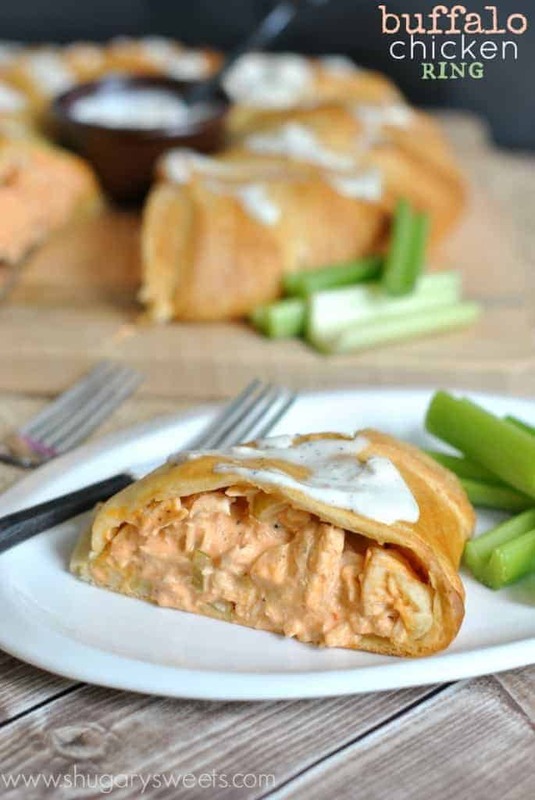 What a great way to eat buffalo chicken! You’ve even got the perfect dressing to go with it. I do love buffalo chicken dip…I think I like it even more wrapped in a yummy crescent ring!!!! Looks like perfect football food! I would be everyone’s favorite foodie if I made this for game day! Buffalo chicken is one of my favorite pizza (and everything) flavors – this ring is right up my alley! Wow, this looks and sounds amazing. Yum, yum, yum!